← Quantitative Easing in the EU: Addressing the Symptom or the Cause? What does a presidency on the rocks mean for the Mexican economy? Mexico is in the midst of a political crisis that shows no signs of abating. 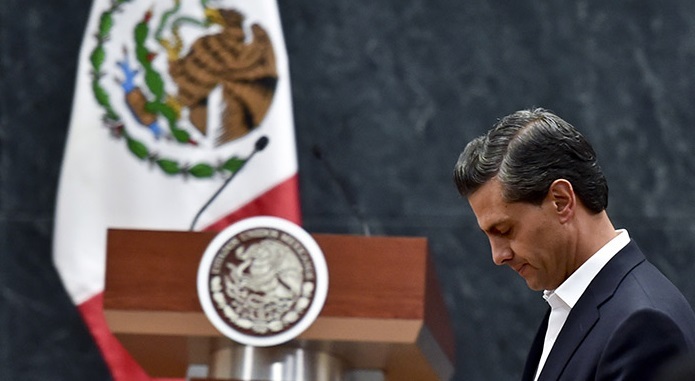 Since late 2014, three scandals have rocked President Enrique Peña Nieto’s administration. Each one reveals broad and longstanding fault lines in the country’s political, economic and security apparatuses. 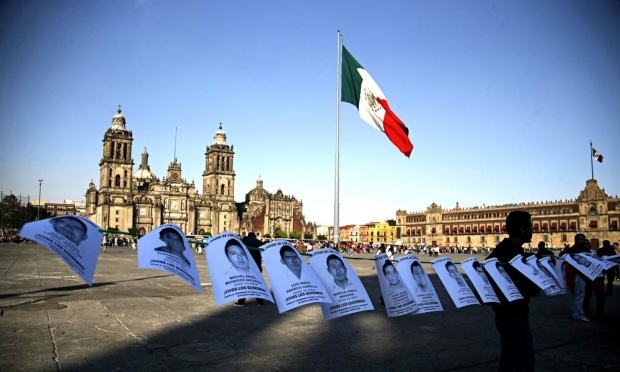 In June, 2014 the shooting of 22 citizens at the hands of Mexican soldiers in Tlatlaya, Estado de México, bolstered fears of rogue security forces operating beyond the scope of the capital. Later, in September, the disappearance and suspected murder of 43 students near Iguala reflected the persistent penetration of narcotrafficking into Mexico’s local politics and its horrific results. Shortly thereafter, the revelation of shady financing behind real estate purchased by President Peña Nieto’s wife reaffirmed the commonly held belief that the same grease is still used to keep the wheels of Mexican business rolling. Peña Nieto, who entered office in 2012 as a hard-charging reformer, has underwhelmed in his responses to all three crises. His popularity has suffered; his approval rating now hovers below 20 percent. Sustained protests suggest that many Mexicans will no longer tolerate the corruption and inefficiency historically endemic to their country’s governance. These developments will surely affect Mexican politics in legislative elections slated for June, though the repercussions may be felt sooner. But will the controversies affect the Mexican economy? While the crises may sidetrack Mexico’s reform momentum which analysts had expected to boost growth, at this point, the scandals do not appear to threaten Mexico’s underlying economic foundation. Economists predict Mexican growth, which averaged a paltry 1.8 percent increase annually since 2013, will accelerate in the coming years (the IMF, for example, forecasts 3.7 percent annual growth between 2015 and 2017). 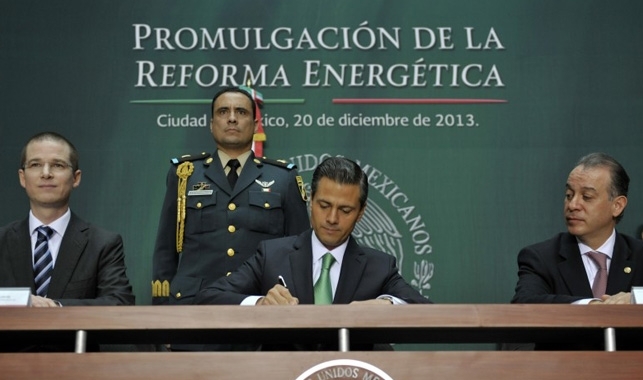 Much of this optimism stems from Peña Nieto’s ambitious reform package. While reforms of the 1990s paved the way for Mexico to become a global manufacturing hub, they left intact sectors unaffected by opened borders. In 2013, Peña Nieto sought to address this by bringing together the country’s three major parties to address fiscal, banking, education, telecom and political inefficiencies. Most famously, the president’s plan called for energy legislation that would open Mexico’s vast oil and gas reserves to international investors. In an interview with me in late 2013, former Mexican Finance Minister Pedro Aspe suggested that these new laws would lead to five percent annual growth, potentially by the end of the Peña Nieto sexenio. But the political crisis will almost certainly slow Mexico’s reform momentum. Peña Nieto may be the figurehead of new laws, but their implementation requires bipartisan support, preferably from the PRD and the PAN, but certainly from at least one of the two for true change to be successful. At the moment, there is little incentive to collaborate with a president whose popularity is plummeting. If anything, politicians may wish to distance themselves from Peña Nieto and his PRI party as the June mid-term elections approach. If the president becomes politically toxic, the reform process could sputter, and any potential growth gains will remain years away. There are challenges outside the political arena, too. The expected kick-start from Peña Nieto’s plan assumes strong buy-in from international investors. The opening of the energy sector, for example, depends on responsible and high-quality international investment. Between security and corruption concerns, the current political crisis could dampen international interest in long-term, capital-intensive projects in Mexico. Where are the missing students? Mexicans demand answers. While the political crises may negatively influence growth, they pose a less immediate threat to Mexico’s economic foundation, which is largely based on exports of manufactured products, macroeconomic stability and (albeit incomplete) fiscal maturation. Political turmoil should not affect gains in Mexico’s manufacturing competitiveness, for example, in the auto sector. With roughly 80 percent of Mexican exports destined to go north, the US―as long as it continues to expand―should tug the Mexican economy along. Moreover, as the most advanced manufacturer in the inchoate Pacific Alliance and as an active negotiator in the Trans-Pacific Partnership (TPP), Mexico stands to gain from further integration. Mexico’s macroeconomic outlook also remains solid. Its central bank retains its independence and is thus largely unscathed by the current political crises. Inflation is expected to remain close to the bank’s three-percent target in the coming years. Like many emerging-market currencies, the peso will face pressure given expectations of US Federal Reserve moves to increase base rates in 2015. But with foreign-currency reserves up more than 30 percent since 2010, Mexico has ammunition to defend the peso. Fiscally, the country maintains a reasonable primary deficit and a manageable debt portfolio. Some threats have emerged, such as falling oil prices and an expanding portfolio of foreign-held, liquid, local-currency debt, but Mexican officials hope increased tax revenue can offset some of these issues. At the moment, Peña Nieto might be compared to a boxer who has suffered a series of body blows and appears rather woozy in the ring. It is likely that at least one more security crisis will occur on his watch, and he may be implicated in further unseemly business associations. Could he withstand another haymaker? If he cannot, a leadership vacuum might emerge. The right-leaning PAN remains divided between party leader Gustavo Madero and ex-President Felipe Calderón. On the left, Andrés Manuel López Obrador is still the best positioned to lead, but he has been unable to muster mass support since his near-miss presidential bid in 2006. Should disgruntled voters stay at home or spoil their ballots in June elections, the PRI could capitalize by activating its party machinery on election day. Such a result might further alienate Mexican voters genuinely angry with the status quo. Though unlikely, if circumstance deteriorate to the point that Peña Nieto resigns or is removed from office, the spillover effects would almost certainly derail any economic momentum the country possesses. For Mexico’s sake, the most pressing reform on Peña Nieto’s agenda should perhaps be of himself. This entry was posted in Mexico + Central America and tagged 22, 43, Economy, Enrique Peña Nieto, Growth, iguala, Latin America blog, Mexico, political crisis, reform, tlatlaya massacre. Bookmark the permalink.